My wife Stacey and I have enjoyed the privilege of serving at my home church as assistant pastor since 1991. 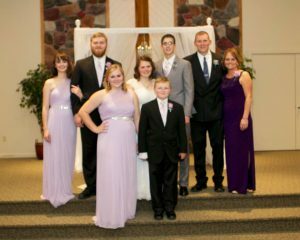 God has blessed us with 4 children, two of whom are married: Alyssa (and her husband Isaiah) Miller, Dalen (and his wife Brittney), Molly, and Riley. As part of the pastoral staff, I have the privilege of coordinating ministry to junior high and high school teens, and I oversee the ministries of Sunday School, AWANA, Children’s Church. I enjoy being a part of my community as a certified Level II Firefighter and Captain with our local fire department, a mentor at the local school, and a part of the volunteer chaplain department at the local hospital. My passions are pursuing Christ and loving my family. From time to time I have the time to do a little hunting or fishing, and I always enjoy things that make life extremely funny. Interestingly enough, life often returns the favor!